← June 8, 2014. Impressions from France. Six weeks, or forty-two days, we have been in France. 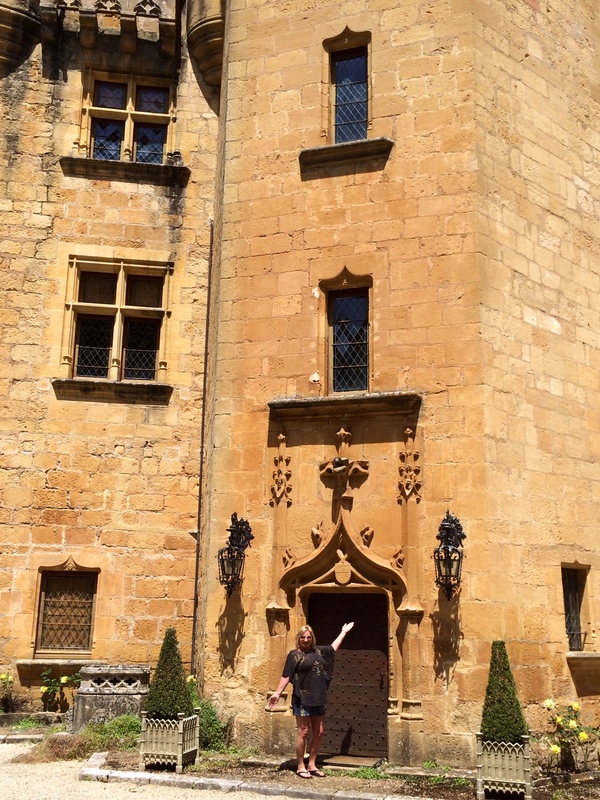 This week we got to see the Chateau Clarens, which is next door to our maison, up close and personal, but only from the outside. It has been beautifully restored, with formal gardens, a swimming pool and a view of the river Vezere. The owners were away this week and their property manager invited us to do a walk around. It is 5 stories. 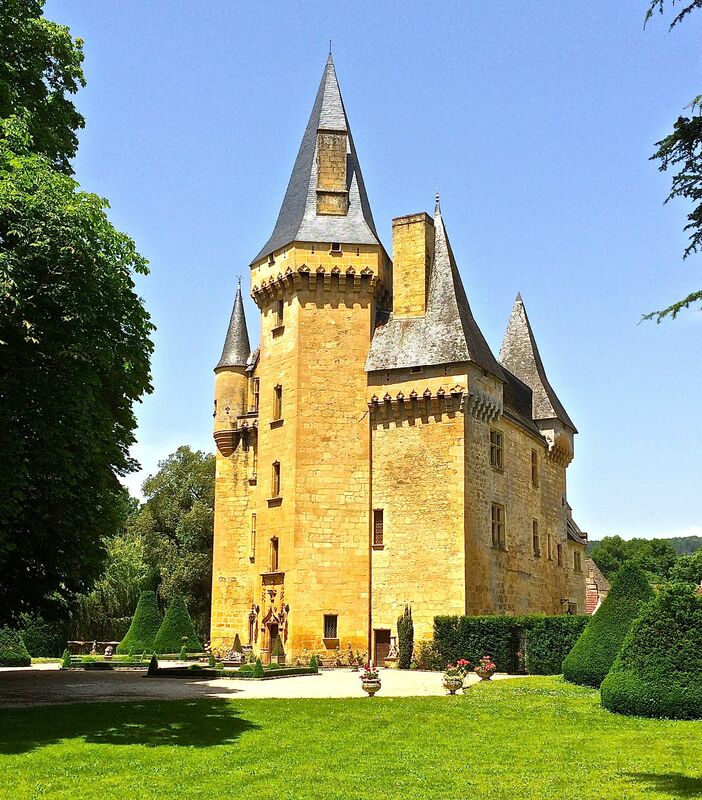 The rumor in the village of St. Leon-sur-Vezere is that the Chateau is for sale, but no one knows how much the owners are asking for it. 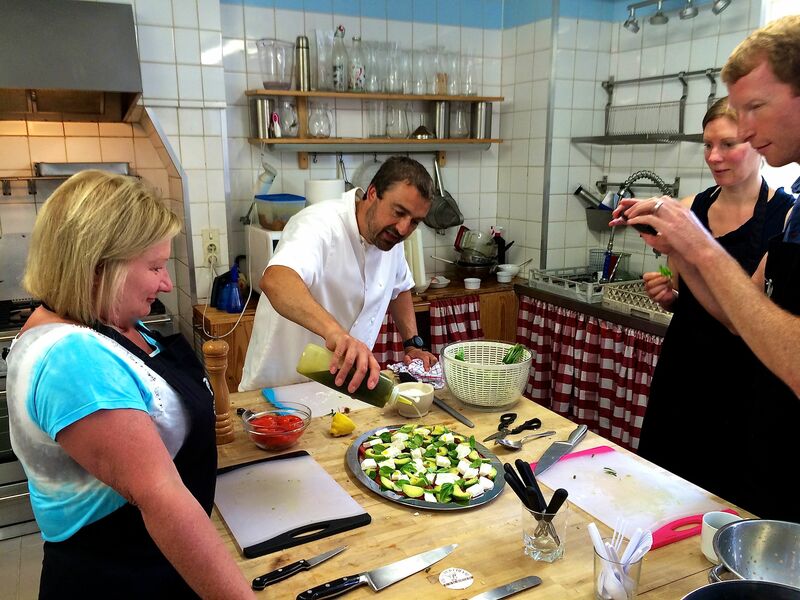 On Tuesday, we took a cooking class at Le Chevrefeuille, which is a hotel and restaurant (more like a bed and breakfast or what they call a “Gite” here in France) which is about 7 km away from St. Cyprien, a small village nearby. The class was taught by Ian, who is English, but started the hotel a few years ago with his English wife Sara. Le Chevrefeuille means honeysuckle in French. The hotel is small, lovely, well maintained and looked after by Ian and Sarah. We only had one other couple in our class. They were Matt and Amanda, a very nice young couple from Australia, but have lived all over the world in the last 12 years. The class started with a visit to the fresh market at La Bugue, another small village, nearby us. 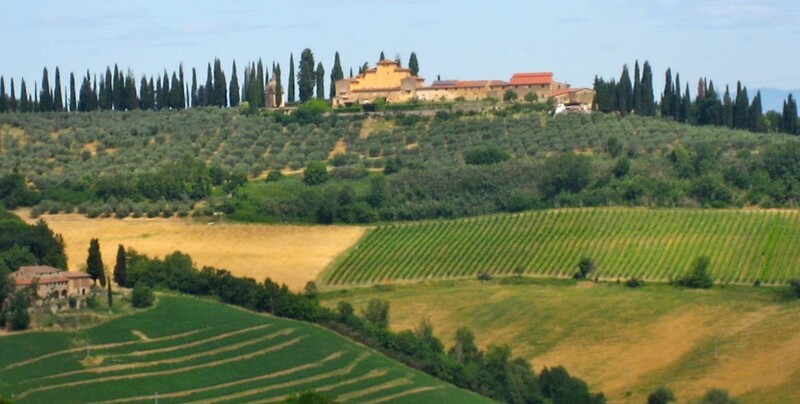 Each of the villages has a fresh market day. At the market, we bought goat cheese, “fromage de chevre”, which was only one day old from the farmer who raises the goats. We also bought mushrooms, “champignons”, from the vendor who searches the woods for them, finds them and then sells them in the market. Next, we bought fresh vegetables including cauliflower, “chou-fleur”, flat beans or broad beans, “feve”, and peas, “petit pois”. Ian knows all the vendors, speaks fluent French and, of course, the whole shopping experience is a social event, more than a shopping trip. The last thing we bought was foie gras. The foie gras was 36 euro or about $50 US dollars per kilo, which is 2 ½ pounds. Thus, foie gras is about $20 a pound. Foie gras is goose liver. But, it is a liver from a goose that has been forced fed corn until its liver is six to ten times its normal size. France is the largest producer and consumer of foie gras, where it is considered a delicacy. The procedure of force feeding the geese is very controversial and many countries, and most noticeably the state of California recently, have banned the sale of foie gras. When the foie gras vendor was explaining to us the procedures for force feeding the geese, she said in very broken English that the geese were “force fed” and then changed her sales pitch to just “fed” to be more politically correct. After shopping for about two hours, we returned to the hotel kitchen and began preparation of our dinner. We started by making a dessert of individual chocolate molten lava cake using lots of fresh vanilla. 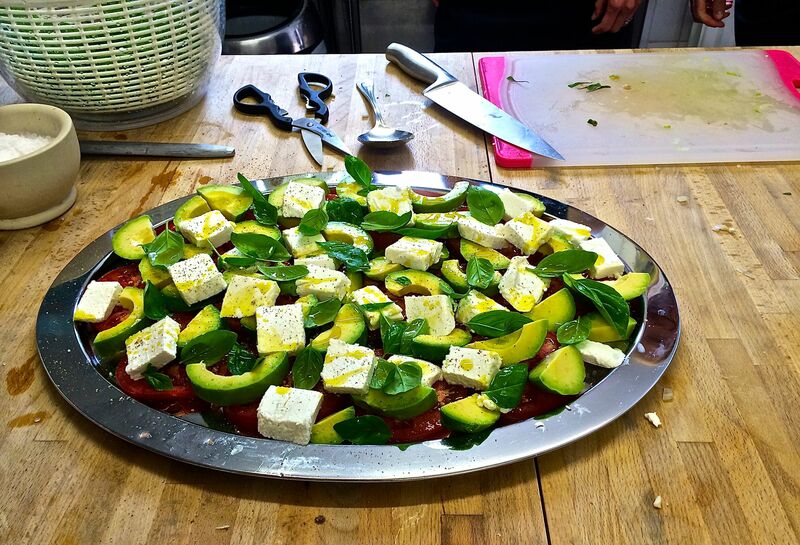 Then, we made a tri-colored salad of avocado, which is “avocat” in French, peculiarly the same word as “lawyer” in English, fresh tomatoes and the fresh goat cheese we bought in the market. See the rest of our cooking class photos. After completing the salad, we made mini-cups of “veloute de chou-fleur”. This is a deliciously, thick cauliflower soup made of chicken stock and liquefied cauliflower, rather than cream, butter and flour. Next, we made green olive tapenade by blending capers, anchovies, olive oil, garlic, and green olives. For the next course, we quickly fried the foie gras in its own duck fat. 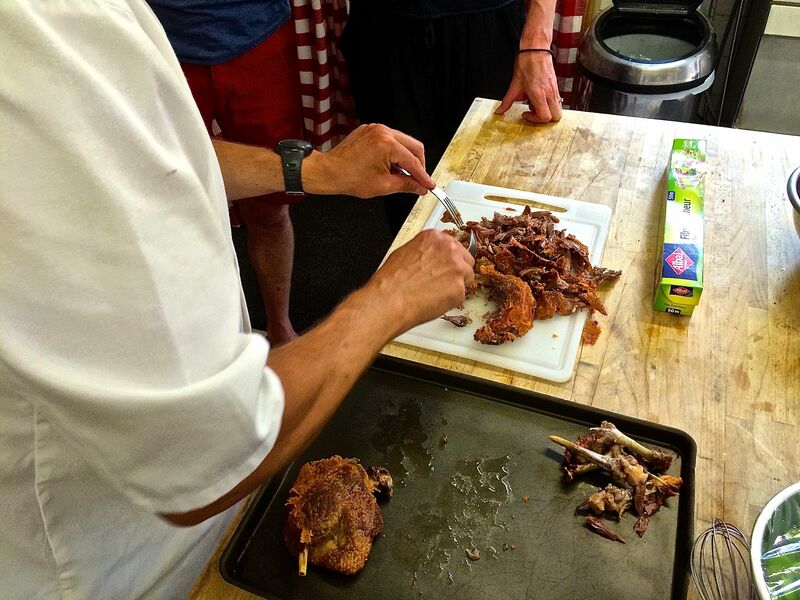 Finally, we prepared “confit du canard” which is the leg and thigh of the duck broiled and then shredded. Of course, Ian had prepared a wonderful sauce made out of the mushrooms, stock, wine, and some chestnuts and we used the broad beans and the pois as the healthy sides. To accompany the food we prepared for dinner, we had white and red wine. The class lasted for 7 and a half hours and was a wonderful introduction to French cooking. 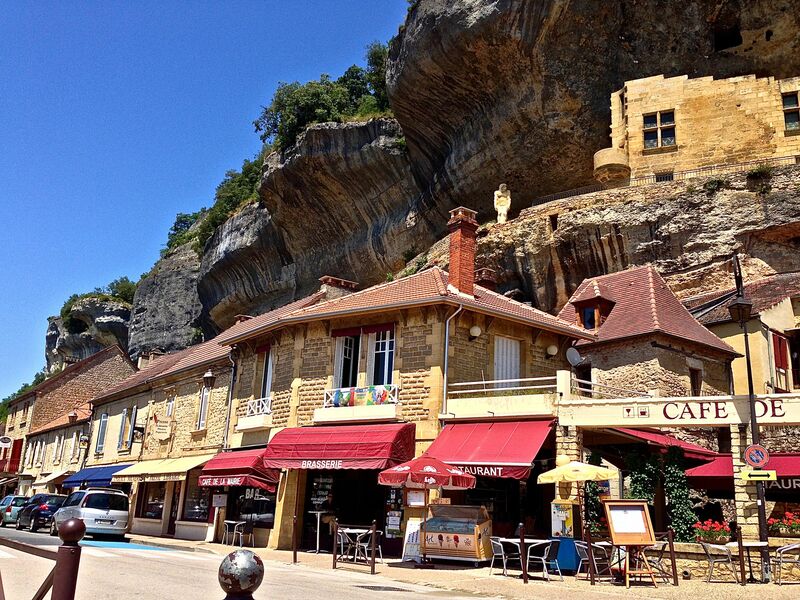 On Wednesday, we went to Les-Ezyies, another small village close to us for lunch. The restaurant had a beautiful garden. 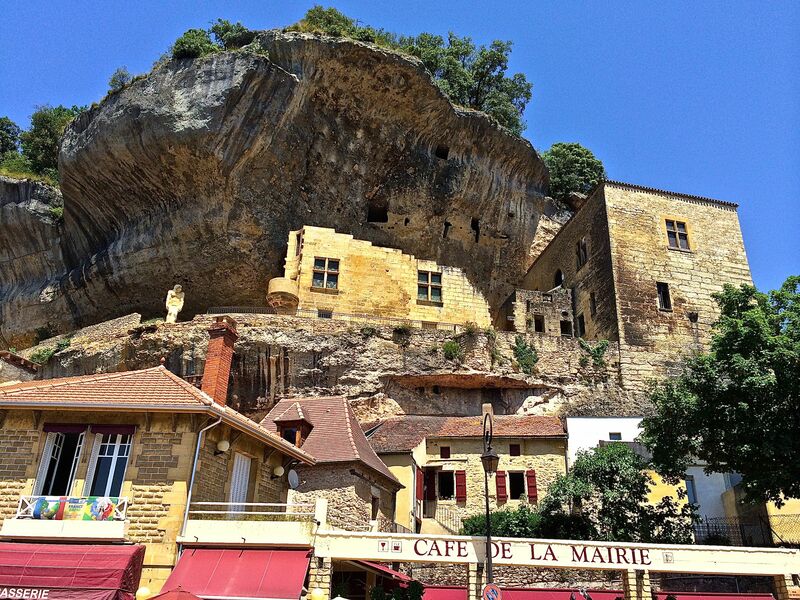 Les Ezyies is built into the limestone rocks and around the caves where those pesky little Troglodytes lived. We are looking for trolls, but have not seen any yet. 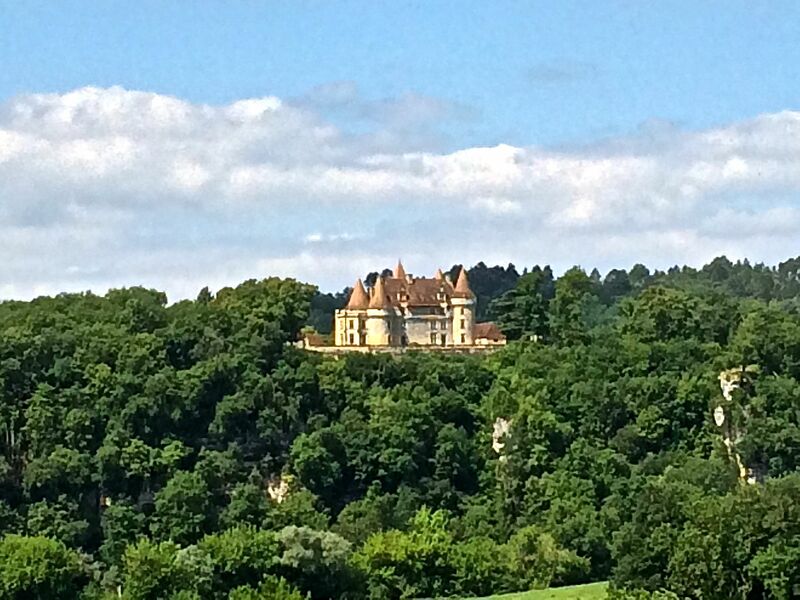 On the way home, we drove by beautiful castles like the Chateau de Marzac in our photo section. 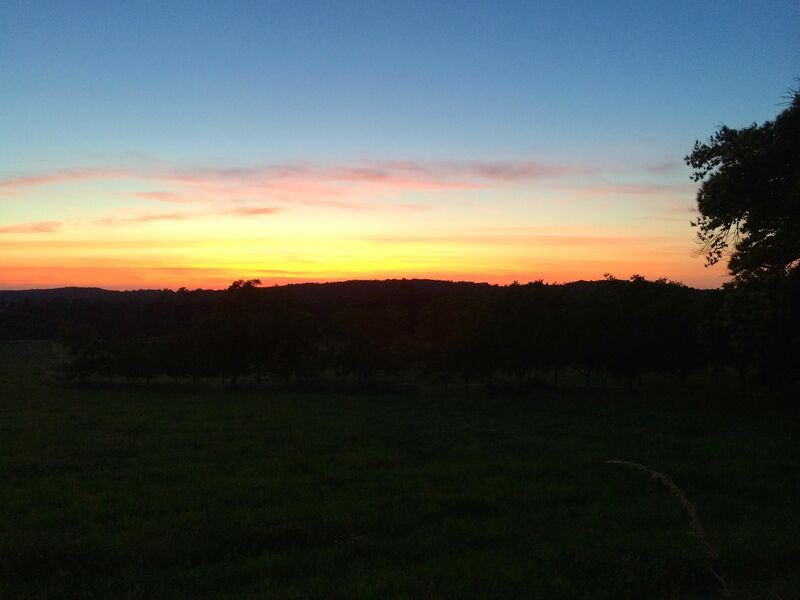 Finally, as we approached our village of St. Leon-sur-Vezere, we watched the beautiful sunset. The rest of the week was spent on personal maintenance, meaning cooking, cleaning, shopping, and eating. We also take turns at the pool, pretending we are Zonker Harris, the Doonesbury character, who was a professional tanner. The pool has been wonderful since the temperature had climbed to 30 degrees Celsius, which is about 86 degrees Farenheit. On Friday, we returned to Le Chevrefeuille for fish night, invited by our new-found friends Matt and Amanda from our cooking class. A lot of the restaurants around here don’t have a set menu, they just prepare whatever they get at the market that day. So Matt and Amanda pried the secret menu out of Ian and let us know that is would be a Friday fish fry! Rita, being the Catholic that she is, has been to many lenten fish fry’s in her days, was all excited about fried fish, like lake perch or cod, in bread crumbs, hush puppies, French fries and maybe a little slaw on the side. But, the meal was a little more French than that. We had salmon, and some wonderful appetizers, vegetables, cheese, dessert and wine. It could have been a Michelin Star resaurant meal!! We ate on the patio and had a wonderful evening with good food and good conversation. If you want to know how small the world is, anouther couple sitting at the table next to us – met and attended school at DePauw in Greencastle. Well, that is all for now. We have found an old movie channel on our TV that shows movies from the 80’s and movies based on true stories, so we are getting ready to watch “The Outsiders”. Rob Lowe, Diane Lane, Patrick Swayze, Matt Dillon, Tom Cruise, Ralph Macchio, and Emilio Estevez. OH BOY! How do you say “popcorn” in French??? …. P.S. Happy Birthday Bella!! Wow, 15 !! Soon you’ll be driving! Here we are with Ian putting on the finshing touches to our green salad we all made in class! Thank goodness Ian didn’t ban our iPhones! 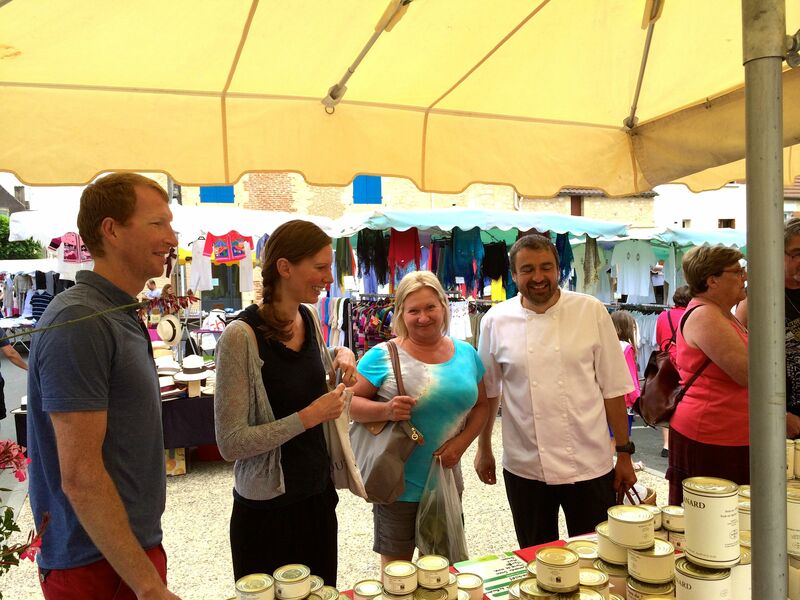 Here we are with Matt and Amanda on the left and Ian on the right side of Rita looking over the fois gras stand at the La Bugue market. 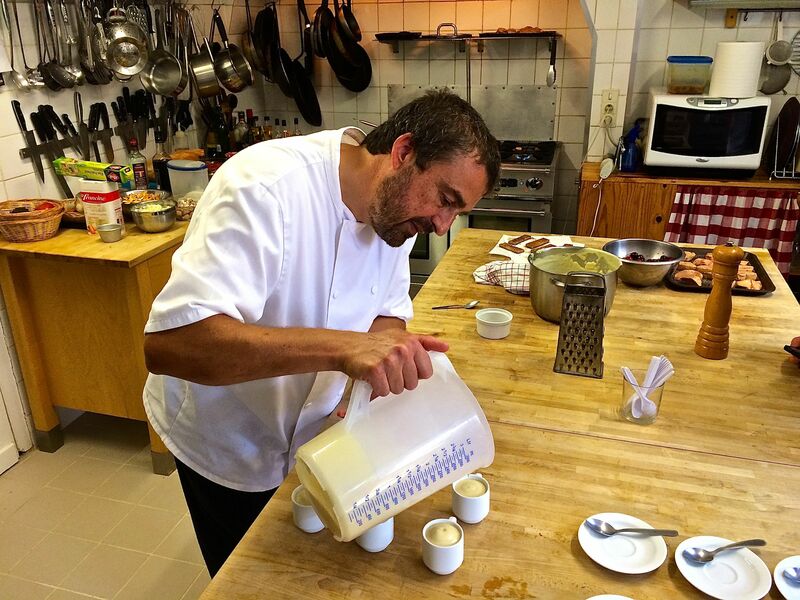 Here is Ian pouring the cauliflower soup into these tiny cups! Another use for the many espresso cups in France. Just enough to wet your appetite and not get too full to enjoy the dinner. Here is the duck after it had been roasted in a very hot pan for about 20 minutes and we are shredding it. 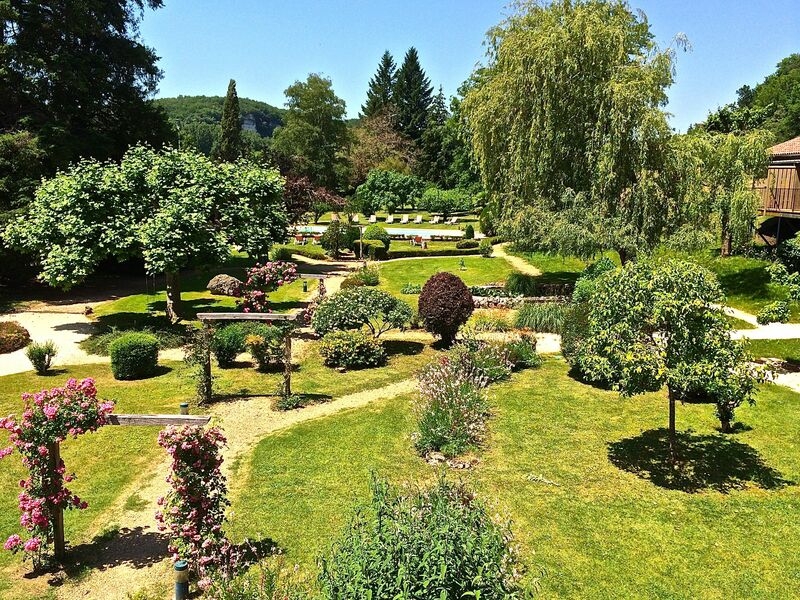 The beautiful gardens at Les Glycine resaurant in Les Eyzies de Tayac Sireuil. Lez Eyzies built into the limestone rocks. Such a beautiful little village street. See the magnitude of the Chateau? Sunset on our way home from our dinner with Matt and Amanda at Ian and Sara’s place. Posted on June 16, 2014 by rita8384	• Bookmark the permalink.